Welcome to the Autumn edition of County Jottings. Our golfing season is complete and although we are disappointed to report that we have not won any trophies, there have been some good individual performances. Our County Team won the League with four outright wins but lost to Surrey in the English Golf Union South Eastern Group final at Liphook. Our Colts finished 2nd behind the powerful Essex team and our Seniors finished 3rd after an indifferent season by their high standards. Congratulations to all the winners of our Championship and Trophy Events, also to those who represented the County at Junior, Colts, Senior and County levels. 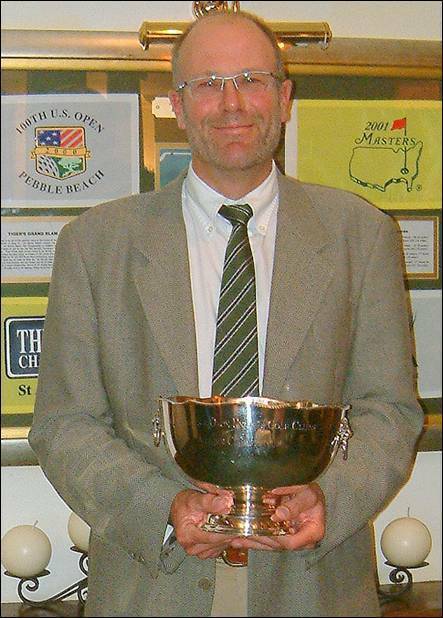 David Lane (Goring & Streatley) again represented England in the Seniors Home Internationals and Duncan Forbes (Sonning) won the English Golf Union South Eastern Group Seniors Championship at Finchley. 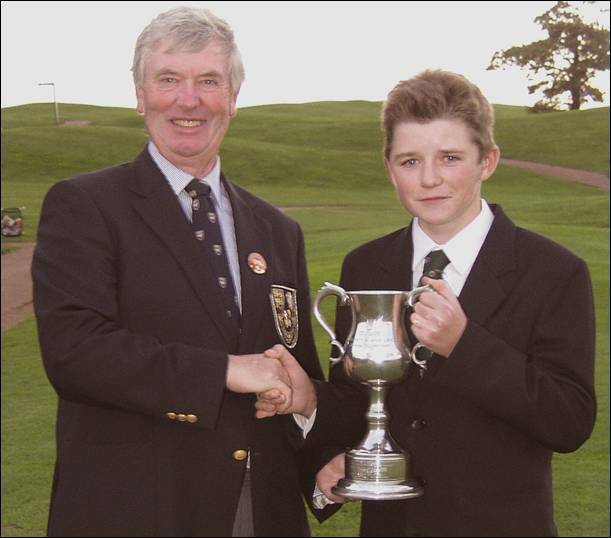 Lastly, congratulations to Eddie Pepperell (Frilford Heath) who won the English Golf Union Junior Under 14 Championship Club title at Kings Norton and is now in the England Under 16 Squad as well as having been selected for Team Faldo. A superb all-round performance saw us ease past Bedfordshire and win the League Title at South Beds on 28th August. Taking all the foursomes in the morning gave us a commanding lead and we ensured the League after winning the first 2 singles. We now take on Surrey in the Daily Telegraph Final at Liphook on 15th October. 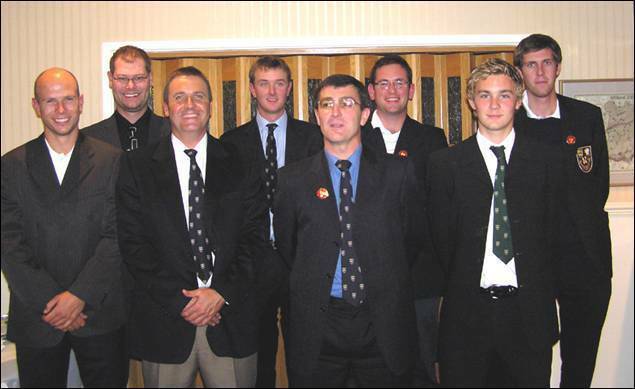 Team at South Beds: David Addison (Donnington Grove), Matt Briggs (Donnington Grove), Craig Buttivant (Gerrards Cross), Carl Corbin (Wokefield Park), Kevin Freeman (Stoke Park), Tom Lawson (Ellesborough), Luke Rusher (Stoke Park), Nick Woodage (Newbury & Crookham). Team at West Essex: Adam Birdseye (Gerrards Cross), Carl Corbin (Wokefield Park), Mark Hall (Oxford City), Ben Harwood (Hazlemere), Michael Joy (Hazlemere), Tim Newton (Reading), Matthew Rendell (Reading), Adam Wootton (Oxford City). 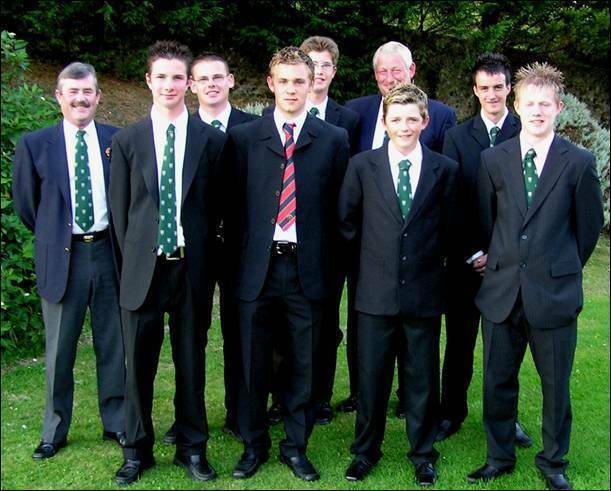 Team at Harleyford: Adam Birdseye (Gerrards Cross), Craig Blow (Buckinghamshire) Matthew Hawkes (Royal Ascot), Nick Howell (Goring & Streatley), Tim Newton (Reading), John Payne (North Oxford), Adam Wootton (Oxford City), Dean Wright (Reading). 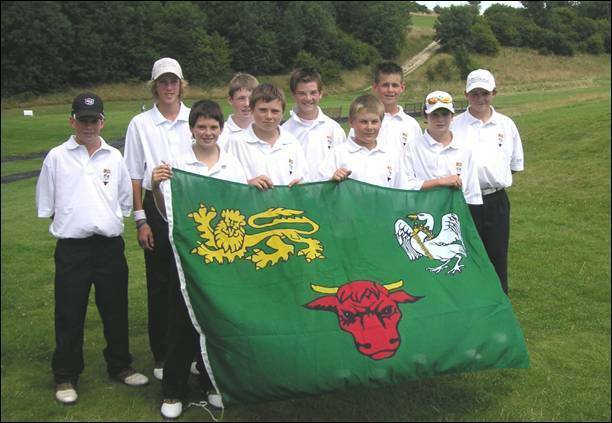 The Under 14 Team lost out to both Sussex and Kent in this tripartite match at Singing Hills on 1st August. A fairly even series of foursomes in the morning left us well in the hunt , but our singles let us down and we finished third with Kent winning both their matches. Team at Singing Hills: Chris Atkins (Kirtlington), Adam Batty (Hazlemere), Tyrrell Hatton (Harleyford), Robert Knight (The Wychwood), Fred Leggate (Sand Martins), Nick Obergan (Gerrards Cross), Tom Obergan (Gerrards Cross), Steven O’Connor (Tadmarton Heath), Chris Whelehan (West Berkshire), George Wilson (Woburn). Team at North Oxford: Adam Birdseye (Gerrards Cross), Sandy Bolton (Frilford Heath), Kristian Branum-Burns (The Springs), Alex Carey (Sand Martins), Mark Hall (Oxford City), Robert Hart (Castle Royle), John McNally (Stoke Park), Carl Norman (Sand Martins), Eddie Pepperell (Frilford Heath), Matthew Rendell (Reading), James Weight (Woburn), Dean Wright (Reading). The Under 14 Team had a much better day at Hockley GC on 7th August as they won both their matches against Hampshire and Wiltshire. Team at Hockley: Adam Batty (Hazlemere), Tom Harwood (Hazlemere), Tyrrell Hatton (Harleyford), Ben Holden (The Berkshire), Steven O’Connor (Tadmarton Heath), George Munsey (Frilford Heath), Eddie Pepperell (Frilford Heath), Chris Whelehan (West Berkshire), Harry Whittle (Woburn), George Wilson (Woburn). Our annual match against Surrey took place at Farnham on 25th August. This match is kindly sponsored by ''The Mugs'' whose wish is to ensure that the highest traditions of the game are handed down to the younger generations. In the 12th match, we won 9-6 to level the series. 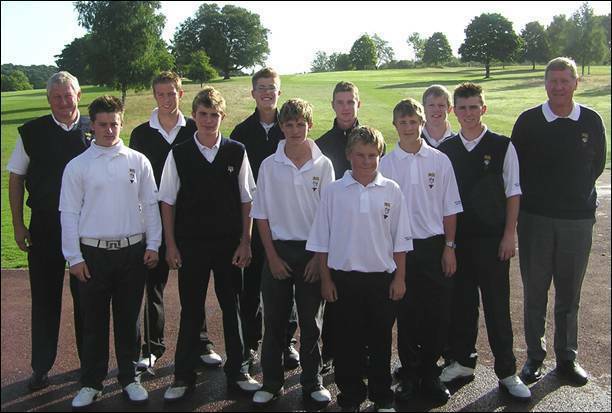 Team at Farnham: Sandy Bolton (Frilford Heath), Robert Hart (Castle Royle), Tyrrell Hatton (Harleyford), James Hewitt (Gerrards Cross), John McNally (Stoke Park), Craig Tackley (Hazlemere), Andrew Tucker (Frilford Heath), James Weight (Woburn), Joe Winfield (Woburn), Dean Wright (Reading). A strong Essex side ended our hopes of retaining our League Title as we went down to 3½-6½ at Theydon Bois on 17th August. Team at Theydon Bois: Bob Clarke (Mentmore), Jim Cameron (Harleyford), Rod Crisp (Ellesborough), Ian Disney (Frilford Heath), Roger Gaudoin (Mentmore), John Gill (Sonning), Roger Mawle (Tadmarton Heath), Gilbert Runnicles (Gerrards Cross), David Stevenson (Ellesborough), David Young (Denham). The Seniors had an excellent day at Calcot Park on 23rd August in the Preliminary round of this event. Drawn against Hampshire in the morning the team won through 3-2 and then took on Surrey in the final. An emphatic win followed as we took every game comfortably and now go on to meet the other sectional winners at North Wilts on October 20th. Team at Calcot Park: Jim Cameron (Harleyford), Rod Crisp (Ellesborough), Ian Disney (Frilford Heath), David Doodson (Temple), Duncan Forbes (Sonning), Robert Gill (Gerrards Cross), Ian Hunter (Maidenhead), David Lane (Goring & Streatley), Gilbert Runnicles (Gerrards Cross), David Young (Denham). 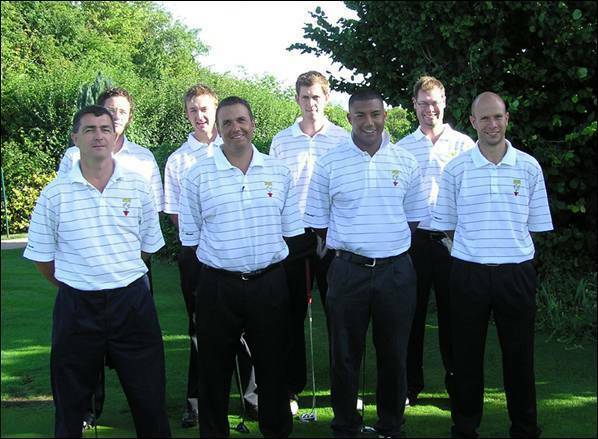 A strong finish to the League season enabled us to beat Bedfordshire 8½-1½ at Gerrards Cross on 19th September. Team at Bedfordshire: Peter Batchelor (Woburn), Jim Cameron (Harleyford), Rod Crisp (Ellesborough), Ian Disney (Frilford Heath), Duncan Forbes (Sonning), Robert Gill (Gerrards Cross), Ian Hunter (Maidenhead), David Lane (Goring & Streatley), Gilbert Runnicles (Gerrards Cross), David Young (Denham). 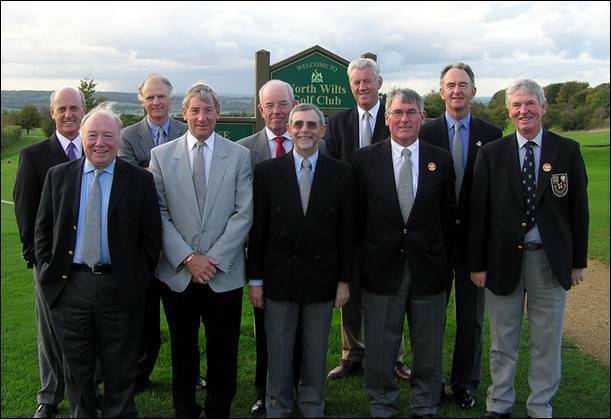 Team at North Wilts: Jim Cameron (Harleyford), Rod Crisp (Ellesborough), Ian Disney (Frilford Heath), David Doodson (Temple), Duncan Forbes (Sonning), Robert Gill (Gerrards Cross), Ian Hunter (Maidenhead), David Lane (Goring & Streatley), Gilbert Runnicles (Gerrards Cross), David Stevenson (Ellesborough). 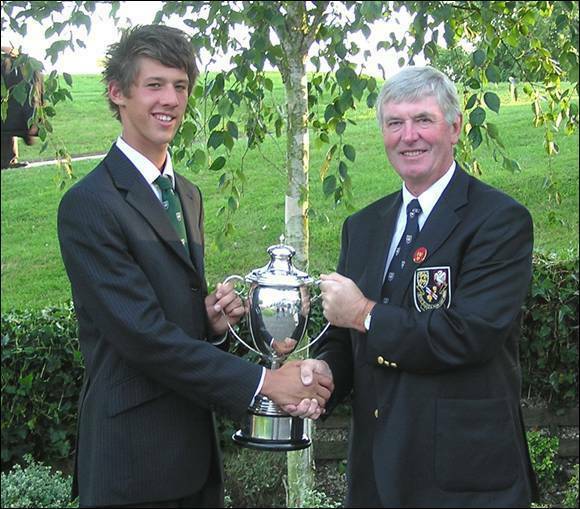 The BB & O Colts Championship was played at Wokefield Park Golf Club on Monday 8th August 2005. Some 59 players aged 21 and under contested the Championship. All but three of the field were 5 handicap and below, but they found the 6,996 layout quite testing in the hot and dry conditions. Only two players beat the par of 72 in the morning with Nicky Howell (Goring & Streatley) and Tim Newton (Reading) leading the way after rounds of 71. Local player Guy Kleinhaus and Nick Scrutton (Maidenhead) were close behind with rounds of 72 with Michael Joy (Hazlemere), Richard Kemp (Woburn) and Will Roebuck (Mentmore) very much in contention after scoring 73. Altogether 11 players were within 4 shots of the lead and all had a chance. Many players improved on their morning efforts having discovered that the rough was quite penal in places. After 9 holes in the afternoon, the Championship had developed into a two horse race with Michael Joy reaching the turn in two under par, he drew level with Tim Newton who was playing steady par golf. Newton continued in this vein and came home in level par for another very good score of 72 to add to his morning effort and his one under par total gave him a healthy lead in the Clubhouse. His only serious challenge would come from Michael Joy and he moved into the lead after two more birdies. His aggressive style would cost him dearly though as he felt he needed more birdies to win the title and with that he immediately dropped a shot on his 17th hole. As he tried to recover with another birdie at the extremely tough finishing hole he found further trouble and slipped back to finish one behind the very promising Tim Newton, who still has 5 more chances of winning the title again. Playing for the ‘Busby Bowl’ the handicap event is also normally closely contested but Newton’s excellent net 135 ensured he won the Bowl by a comfortable margin. 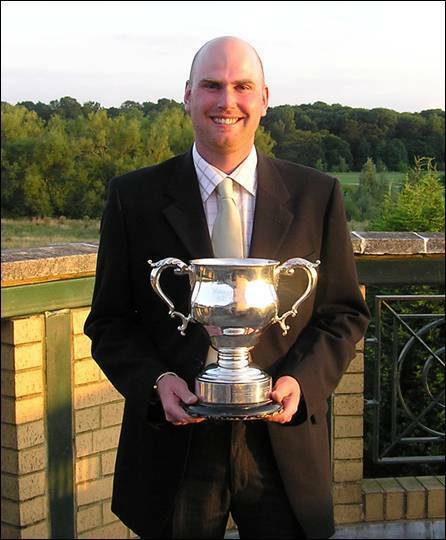 The BB & O Boddington Trophy was played at Mentmore Golf & Country Club on Monday 12th September 2002. Just 50 players entered and it was again disappointing that we did not have a full field to play on a top course at a bargain price. Scoring was quite difficult all day but in the morning round three players were able to score under par with David Summers (Oxford City) and Nick Woodage (Newbury & Crookham) leading the way with 2 under 70s and Leon Beer (Goring & Streatley) one shot further back. Ian Churcher (Donnington Grove) and Michael Sanders (Beaconsfield) were well placed on 72 and 5 further players were on 73 and in the running. The afternoon conditions improved but strangely the scoring did not. Richard Lee (Goring & Streatley) set the early pace after recording another 73 but he was soon overtaken by Michael Sanders who also had a 73 to move 1 shot clear. Out on the course Nick Woodage had reached 6 under par after 9 holes, despite two bogies – the Trophy looked his for the taking as he led by 4 shots from David Summers. Disaster struck however and a series of out of bounds shots ruined his day. Summers meanwhile continued to play very steadily and after another birdie at the 17th and with a solid par at the last he was comfortably home by 2 shots. The BB & O Junior Champion Club Team Finals were played at The Downshire Golf Course on Thursday 1st September. The event is contested by the top 6 Clubs qualifying through a Junior Medal round played at their home course between May and August. This final format is the best two net medal scores from three counting. Players are restricted to 24 for Boys and 36 handicap for Girls. The leading Club goes on to represent BB & O in the English Junior Champion Club Tournament being held at Woodhall Spa Golf Club on 15th & 16th October. Many of the competitors were playing in their first major event but overall the scoring was excellent. Easthampstead were likely favourites around their own course but Calcot Park and Hazlemere set the early pace on 138 and 139 respectively after their first two players had finished. Hadden Hill were putting up a valiant defence of both their BB&O title and that of English Junior Champion Club which they won last year. Their first two players also came in with a total of 139. We then expected a tight finish but this was denied by Joe Bonner who produced a stunning net 58 to spread-eagle the rest of the field and enable Calcot Park to have the luxury of discarding Paul Rice’s solid net 72 before counting Charlie Guest’s net 66 to produce a fantastic score of 124 to win by 15 shots from Hadden Hill who pipped Hazlemere on countback. 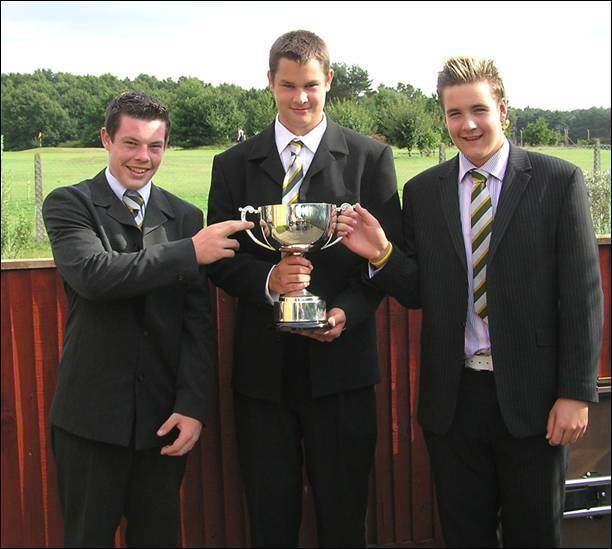 We wish Calcot Park luck in their attempt to become English Junior Champion Club later in the year at Woodhall Spa GC. 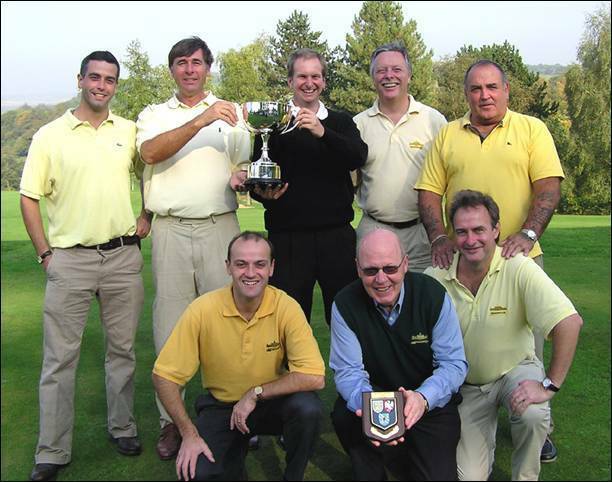 The BB & O Autumn Trophy was played at Mill Ride Golf Club on Friday 30th September 2005. The field of 65, once again, consisted mainly of players of 5 handicap and below and it was good to see that we had a full field for this final Order of Merit Event. Matthew Briggs (Donnington Grove) had already secured the OOM title as his nearest competitors had not entered this event. This was the first time Mill Ride had been used for a major event and the players found the 6,845 yard layout extremely difficult in the damp conditions. Scoring was high as the CSS went up 2 to 75 for both the morning and to 74 in the afternoon. After the morning round, three players contested the lead on 75 – Jon Carter (Reading), Robert Hart (Castle Royle) and Andrew Stracey (Denham) – with several other players within a shot or two of their scores. In the afternoon, Hart and Carter fell back but Stracey continued his solid progress to record an excellent 74, for a final winning total of 149. Meanwhile, young Matthew Hawkes (Royal Ascot) and the evergreen Steve Barwick (East Berkshire) sprang into prominence with rounds of 73 and 72 respectively – the best of the day – to take second and third places. In the handicap competition, Ray Hutton (The Lambourne) returned a very steady 145 net to take first place with Kieren Quinn (Hurst) and Adam Glass (Caversham Heath) taking the minor places. Stoke Park Club and Newbury & Crookham Golf Club met in the 14th Hillman Trophy Final at Temple Golf Club on Saturday 15th October. Play is over 18 holes singles matchplay for a seven man team, with each team having three players in handicap range 6 to 9 and four with a handicap of 10 and over up to a maximum of 20. 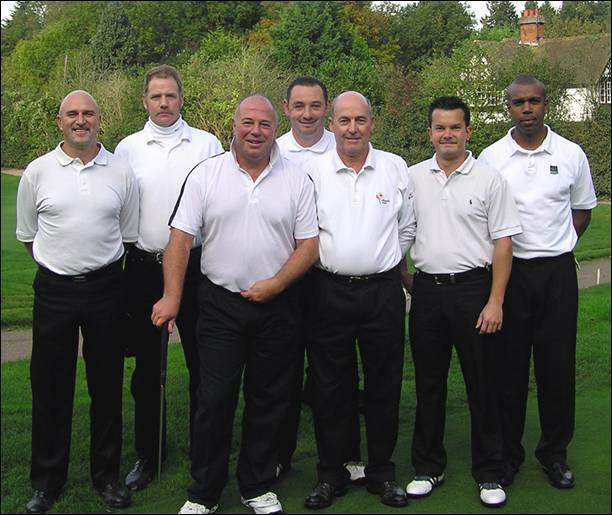 Stoke Park: Bryan Anderson, Martin Clifford-King, Paul Hucker (Captain),Graham Lees, Peter MacDonnell, Patrick Mattar, Peter Palmer. 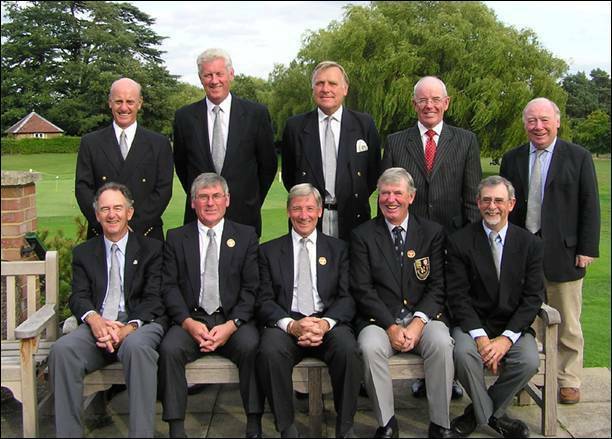 Newbury & Crookham: Roy Burnard, Harvey Dobson (Captain), Gary Frood, Bob Mavis, Roger Rhymes, Wilf Sequeira, Barry Sturgess. Magnolia Park Golf & Country Club and Mill Ride Golf Club met in the 11th Hillman Trophy Plate Final at Henley Golf Club on Saturday 22nd October. Play is over 18 holes singles matchplay for a seven man team, with each team having three players in handicap range 6 to 9 and four with a handicap of 10 and over up to a maximum of 20. Mill Ride were seeking their first win in a final having just missed out in 1993 in the Trophy and again in 1999 in the Plate. Magnolia Park were in their first final and a first class competitive match was in prospect. The handicap differences were minor but seemed to slightly favour Mill Ride. After 5 games it was 2½ - 2½ and as the sixth game teed off the 18th all square, the news came back that Mill Ride had won the final game and that Magnolia Park had to win the last hole to tie the match. A great birdie 4 under great pressure from John Paul Clouden left the match to be decided by a sudden death play off between the last halved match. Robert Darvill from Magnolia Park hit a great pitch at the first extra hole to consign Mill Ride to their third defeat in finals. No doubt they will try to put that right next year! Magnolia Park: Des Boulter (Captain), John Paul Clouden, Robert Darvill, Nick James, Steve Lawrence, Sean Stanley, David White. Mill Ride: Les Commerford, Stuart Davidson-Wright, Stuart Hobbs, Keith Loader, Brain Mason (non Playing Captain), Marino Molinari, Shane Raynor, Wayne Sheffield. The BB & O Boys 14 years and Under Championship was played at Hinksey Heights Golf Club on Tuesday 25th October. There was a record entry of 49 boys with handicaps of 20 or less for this Championship over 27 holes Once again we had a dry day but with a very strong breeze blowing the boys found scoring very difficult - to such an extent that the morning round ended up as a reduction only for handicapping purposes. At lunchtime only Ben Cotton (The Wychwood) and Eddie Pepperell (Frilford Heath) had managed to break 80 and they held a three shot lead from Max Smith (Newbury Racecourse) and four from Harry Whittle (Woburn). Jonathan Hewitt (Gerrards Cross) was another shot further back and it didn’t seem that anyone else could challenge the leaders as they only had 9 holes in which to make an impression. With three holes to play Eddie Pepperell - the current English Under 14 Champion - was setting the pace but was just one ahead of Ben Cotton. Things changed dramatically at the very difficult par three eight as Pepperell had a double bogey to Cotton’s par. In extremely difficult conditions Pepperell made a great birdie and with Cotton knowing he had to match this to win - as any other score would give Pepperell the title on countback - he just missed out to finish 1 shot adrift. Max Smith made a valiant effort to challenge but despite two fine birdies to finish he fell short of the target. Cotton was the clear winner of the handicap section and was the only player on the day to reduce his handicap. In the handicap prize section Michael Johnson (Maidenhead) led the way from Charlie Guest (Calcot Park) with Jamie Davies (East Berkshire) claiming third prize. Finally, all the Boys enjoyed the fine show put on by Head Professional Dean Davis who proved you can hit the ball straight even in a 30 mph crosswind - but only with a funny looking club! Played at Worthing Golf Club on Wednesday 17th & Thursday 18th August our Team of 7 players were: Adam Birdseye [Captain, (Gerrards Cross)], Mark Hall (Oxford City), John McNally (Stoke Park), Eddie Pepperell (Frilford Heath), James Weight (Woburn), Adam Wootton (Oxford City), Dean Wright (Reading). The format is to play 2 foursomes games both morning and afternoon. Counties are allowed to play any 6 of the 7 players throughout the Championship. We had got back into this event having been one of the two Counties relegated at West Hill in 2003. With 11 Counties in the English Golf Union South Eastern Group 2 must drop out each year to allow the event to be completed in two days. We got off to the worst possible start in the morning losing 2-1 to Kent and 3-0 to Suffolk. The afternoon pairings were switched slightly but again we only managed to win one game and lost to Norfolk 3-0 and to Middlesex 2-1. Given that the draw for day one seemed to give us the best possibility of picking up points, it was immensely disappointing to be last of the 9 teams. The task to avoid relegation on day two seemed huge, but the players all seemed in good spirits as we faced the stronger Counties. We opened up against Surrey and Hampshire and looked at one point as if we could win both matches. Unfortunately we slipped up again and eventually lost them both. Our calculations then showed that, no matter what, we would be relegated and in a face saving performance we took on the two leading Counties of Hertfordshire and Essex in the last matches. Needless to say we played our best golf of the week and easily beat Hertfordshire to deny them the title and were unlucky to lose to Essex who won the Championship. Finishing 9th was a bitter disappointment as we had travelled to the Championship in high expectation of challenging for the Title and not to be struggling to keep our place for next year, when we must have been favourites to win, as we are hosting the event at Gerrards Cross. Team at Liphook: David Addison (Donnington Grove), Adam Birdseye (Gerrards Cross), Matthew Briggs (Donnington Grove), Craig Buttivant (Gerrards Cross), Kevin Freeman (Stoke Park), Tom Lawson (Ellesborough), Luke Rusher (Stoke Park), Nick Woodage (Newbury & Crookham).